On March 20, 2009, in the second round of the annual Billy Bock Classic in Pine Bluff, the Bryant Hornets held an 8-2 lead over the Monticello Hillbillies only to see the Billies rally for a stunning 9-8 victory. 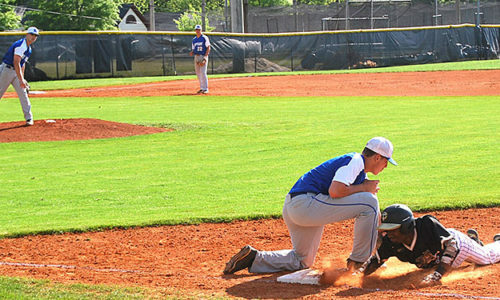 The Billies, including 11 players that participated in the 2009 game and as good as any team the Hornets have played this season, held a 5-2 lead going into the bottom of the seventh inning. Right-hander Caleb Bryant, who started last season's meeting, had allowed just two hits after coming in to relieve in the fourth inning. But both of those hits, singles by Brennan Bullock and Brady Butler, along with one of the loudest outs of the night, a sinking liner to left by Jordan Taylor that Jordan Tilley had plucked out of the air about shoetop high, had come in the sixth inning. Pinch-hitter Landon Pickett stroked a lead-off single to left to start the seventh for Bryant. Though he was forced out on a grounder to short by Chris Joiner, the uprising stayed alive when Joiner hustled to beat the relay to first, avoiding the doubleplay. Garrett Bock followed with a walk then Hunter Mayall worked out a free pass to load the bases for Bullock. The count went to 3-2 before the Bryant senior outfielder shot a single to right, driving in Joiner and Bock to make it 5-4. Mayall got to third but Monticello executed the cut-off and Joiner was thrown out trying to get to second with the potential winning run. With the tying run at third and now two down, the Monticello pitcher issued a four-pitch walk to Taylor, bringing up Butler. After a meeting on the mound with head coach Jim Beasley and the entire Billies’ infield, Bryant (the pitcher) came back with two of his sharpest pitches of the night, a fastball on the outside corner and a biting curve. On the 0-2 pitch, Butler got enough of the ball for a tapper toward third. Monticello third baseman Zach Crossett, who scored the tying run in the 2009 game, charged in, fielded the ball but threw wildly to first. Mayall scored the tying run easily as the first baseman Taylor Smith and right fielder Sam Cason chased the ball down the right-field line. Bryant’s Taylor never stopped and wound up sprinting home with the game-winning run. It was Monticello’s only error of the game. “With that kid (Bryant) throwing, they’re probably not used to people putting it in play,” said Hornets coach Kirk Bock. “Monticello’s a real good team. They threw three real good arms at us. The comeback made a pair of innings where Taylor, the Bryant starting pitcher, and Caleb Milam, who relieved in the sixth, huge factors. In the third, a pair of Bryant errors allowed a run that gave Monticello a 2-0 lead. With a man at second, nobody out and the 2-3-4 hitters coming to the plate, Taylor worked out of the jam. Bryant tied it in the bottom of the inning. Later, with Monticello leading 4-2, Milam came on and was greeted by a single by Taylor Smith and a double by Tilley. He got Kamerson Smith (the winning pitcher in the 2009 game) to hit a bouncer to the right side. Butler, ranged off first then started to go back to the bag as he saw second baseman Chris Joiner ranging over to field the ball. Joiner checked the runner at third to make sure he was staying put then turned to toss to first only to find that Butler hadn’t been able to get back there yet and Milam was just arriving from the mound. So, Kameron Smith reached to load the bases with no one out. A run did score on a wild pitch but Milam proceeded to strand the other two with back-to-back strikeouts and a grounder to short that Taylor made a nice play on to get the final out. The lead at the end was Bryant’s only lead of the game. Monticello scored a run in the first to break on top. Lead-off man Brandon Matthews singled, stole second, took third on a wild pitch and, after Taylor struck out the next two batters, Taylor Smith doubled him home. Taylor struck out Tilley to end the inning. Cason, who pitched in the 2009 game, started on the bump for the Billies and worked around a one-out single by Garrett Bock in the first with the help of catcher Zach Robinson, who threw out the senior center fielder, when he tried to steal second. In the second, Cason retired the first two but then had a battle with Butler who fouled off six two-strike pitches before drawing a walk. Lucas Castleberry followed with a shot to center but was robbed of a hit by Hunter Lawson. After Taylor worked through the third-inning, the Hornets tied it in the third against lefty reliever T.J. Sanders. Caleb Garrett beat out an infield hit to deep short then Tyler Brown worked a walk. Joiner flew out to center deep enough that Garrett tagged and went to third. Bock followed with a squeeze bunt that was placed so well that not only did Garrett score but Bock beat it out for a single without a play. Hunter Mayall was then hit by a pitch to load the bases. Sanders came back to get Bullock on a pop to shallow right that was well played by second baseman Kameron Smith so Sanders was an out away from escaping with the lead. But Taylor beat out an infield hit to get Brown home and the game was tied. Butler flew out to right to end the inning with the bases still juiced. In the fourth, Kameron Smith drew a one-out walk then Cason blasted a two-run homer to center to put the Billies back on top. Taylor came back strong, however, retiring the last five batters he faced to keep it 4-2. Bock helped him get out of the fourth with a nice grab of a liner to center by Crossett. The right-hander then eased to a 1-2-3 fifth. Meanwhile, Bryant relieved for the Billies and retired the first six he faced before Bullock led off the sixth with a single to center. In the top of the seventh, Milam issued a one-out walk to Lawson then Bryant hit a bouncer towards second. Joiner charged and caught the ball just as Lawson got there. The collision knocked the ball into short right field and left both Lawson and Joiner sprawled on the ground. Lawson was able to get to second but he was called out for interference and had to leave the game because he was shaken up. Taylor induced a grounder to short by Taylor Smith to end the inning, setting up Bryant’s game-winning rally. Milam picked up the win in relief of Taylor. In a comeback win over Lake Hamilton earlier this season, it was the other way around with Taylor getting the win in relief of Milam. “We didn’t play as well as we needed to play but we played hard and we never gave up," Coach Bock commented. "If you keep plugging away, good things are going to happen." Now 7-0, the Hornets return to action on Tuesday, March 16, at Little Rock Central in their 7A-Central Conference opener. They return to the Billy Bock Classic on Thursday against White Hall, at White Hall. E—Bullock, Joiner, Crossett. LOB—Monticello 5, Bryant 7. 2B—T.Smith, Tilley. HR—Cason. SB—Matthews. HPB—Mayall (by Sanders). WP—Cason, Taylor 2, Sanders, Milam.